Directed By: Jack Haley Jr.
Tag line: "More than a movie. It's a celebration"
In the early days of Hollywood, studios worked hard at building a “brand” for themselves, a type or style of movie that, for years, would become their specialty. For Universal, it was horror, while Warners focused on realism, pulling topics from the newspaper headlines, such as gangland crime (The Public Enemy) and various social issues (I am a Fugitive from a Chain Gang). But for Metro Goldwyn Mayer, it was all about the music. Beginning just after the advent of sound, when the studio released The Broadway Melody in 1929 (their first all-talking movie and the first sound film to win the Academy Award for Best Picture), M-G-M showed a preference for screen musicals, and in the coming years would turn out some of the finest ever produced. 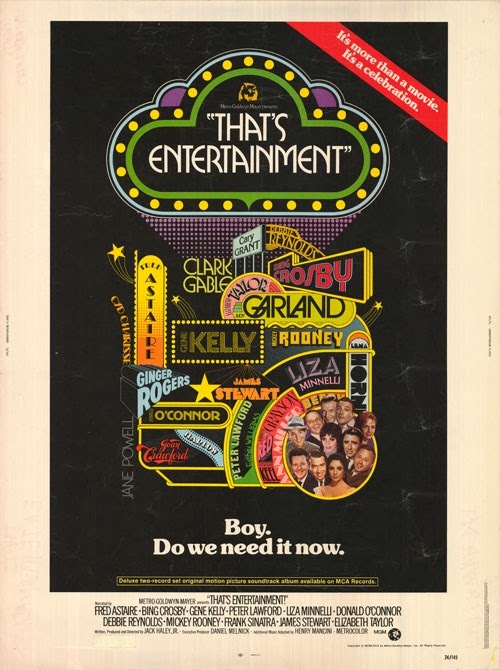 Designed to celebrate the studio’s Golden Anniversary, the 1974 documentary That’s Entertainment! features vignettes from many of M-G-M’s best-loved musicals. Hosted by a handful of the studio’s biggest stars, including Gene Kelly, Frank Sinatra, Mickey Rooney, and Elizabeth Taylor, That’s Entertainment! is a loving tribute to a once-great production facility and a reminder of how much fun the movies can be. As you would expect, That’s Entertainment! devotes a fair portion of its running time to some of M-G-M’s most successful films, like The Wizard of Oz, Showboat, Meet Me in St. Louis, An American in Paris, Gigi, and Singin’ in the Rain. There are also sections dedicated to specific stars, like Fred Astaire and Judy Garland (Esther Williams’ segment was particularly interesting). But for me personally, the best thing about That’s Entertainment! was discovering movies I’ve never seen before. The Broadway Melody of 1940, with Fred Astaire and Eleanor Powell, contains what might be the single most impressive tap dance routine in motion picture history, and I really enjoyed the brief snippet from Two Weeks with Love, in which Debbie Reynolds and Carleton Carpenter performed the 'Aba Daba Honeymoon'. We’re even treated to clips of a few major celebrities not known for their singing doing their best in a musical sequence, including James Stewart, Joan Crawford, and Jean Harlow (the highlight is from 1939’s Idiot’s Delight, where Clark Gable performs "Puttin’ on the Ritz" for Norma Shearer and Edward Arnold). Ultimately, your tolerance for That’s Entertainment! will depend on how much you like the musical films of the ‘30s, ‘40s and ‘50s; casual fans of the genre may end up losing patience (the movie is, after all, comprised almost exclusively of song and dance routines from yesteryear). But if, like me, you enjoy a good musical, then you’re definitely in for a treat.